We all try to think ahead and make a road-map for our lives. I am here to tell you that God has declared in his word that He already has plans for your life. Many times we find ourselves in barren fields of self-doubt, kicking the dust of misunderstanding etched in the ground of our lives’ tragedies and pain. I have been there myself many times in my life; it is a place all too familiar to me. Perhaps you know the place. We have all had times where we thought we were in God’s will only to find things coming apart on the broken wings of good intentions. Many times in life our hopes are bashed, promises broken and our way seems lost. It is in realizing that we are but humble pilgrims lost without God’s direction that we can find our way. As we journey through life, we will get beaten up- we will get hurt and bruised along the way. Scarred memories mark our journey like markers on a highway. There are times of joy and bliss that we savor, but sometimes it seems that they get lost in our journey. People wonder what tomorrow will bring; a better life; a better situation; a more prosperous job; or a happy marriage. It is in God that we can find the hope for our future. If we put our hope in God, there will be no surprising ending in our lives. Isaiah 55:12- So you’ll go out in joy, you’ll be led into a whole and complete life. The mountains and hills will lead the parade, bursting with song. All the trees of the forest will join the procession, exuberant with applause. God knows what His will is for our lives, he has declared it, and it is set in stone. God says to you, “I know what I have the plans I have for you. Gods says, I have success for you, I will make a way for you, I have a job for you, I made you, I formed you, I breathed life into you and I redeemed you. I promise you that God has a plan for you. We have a hunger pang inside of us to have a happy life, and to find comfort and joy in our home and in our relationship. God has a plan to make that happen in our lives. We have to keep our eyes on God and coordinate our spiritual vision with what God has placed in our hands and in our hearts. We have the infallible living Word of God, which is the anvil that has worn out all the hammers of all the lies of the enemy over the ages. We have the Holy Spirit living in us, strengthening us, bringing us comfort and hope. God’s plans for us are found in His Word. Psalm 119:105-Your word is a lamp to my feet, and a light to my path. We have His mighty Word with every promise, every instruction, every commandment, and stories of redemption that we can believe in and stand on. We have in the New Testament the words of our Savior and the message of the cross, by which the Apostle Paul instructs us that through the blood that redeemed us on that Cross, “We are more than conquerors”. Romans 8:37 No, despite all these things, overwhelming victory is ours, we are more than conquerors through Christ, who loved us. We are more than conquerors-over sin, Satan, the world, heartaches, and trials. We can cheerfully face these things as we know God has a plan for our lives and He will perform it in Christ Jesus. Not only will we overcome, we will be there better for what we endure-we will glory in our journey with our Lord. It is His path we follow an as we walk with Him, our faith, and joy, will be increased by what we endure. We are conquerors, victorious by the blood of the Lamb, and the word of our testimony owing all to our Redeemer who has laid out His plan for our life. We are more than Moses who spread the Red Sea; We are more than David who slew Goliath; We are more than Elijah who called fire down from heaven; We are more than Sampson who slew 10,000 men in battle. We are the offspring of the living God by Christ Jesus and what we hold in our hands is His Living Testament of that New Covenant written in His blood, of which we are partakers by His grace. “We are more than conquerors”. God’s plans for our future are found in His Word. God’s promises by the power of the Blood infused with the Holy Spirit give us hope and a future for our life. Let God be God, and He will part the Red Sea in your life. When Moses and Israel stepped out, God performed a miracle for them, and for the first time in history there were footprints seen at the bottom of the Red Sea. Sometimes realizing God’s plan for hope and a new future will lead you where you have never been before. You will not be walking in someone else’s footprints; you will be making your own. You may be leaving footprints where they may have never been seen before in new path blazing through the obstacle that is in front of you, as God destroys the enemy that is behind you. So go ahead and move forward in life knowing confidently that God has it all planned out for you if you will but trust Him. Follow God’s plan for your life, and trust His unfailing, forgiving love. In His plan, every pain, hurt, wound, and disappointment that you have experienced will find peace. If you will but trust His plan for your life, you will find the sense of wholeness and completion that you long for. This goes down as (just another) one of MY FAVORITES! Great, thanks for this, have a great day! In Octtober 2011, I was diagnosed with multiple myeloma and began treatment leading to a stem cell transplant in August, 2012. From the time of my diagnosis, God continued to “give” me a constant peace through Jeremiah 29:11 popping up in strange places and at odd times. Your website message today is just another of those sweet “A-Ha moments” I call my “Kisses from the King.” God is faithful. God is good ! What an uplifting message, thanks Darrell! It is so wonderful that GOD has a plan for our lives, and that HE will make a way when there is no other way. i hope for my footsteps to be where no other foosteps were before. Wonderful post, thanks for writing and sharing. Thank you for this post Darrell. I for sure needed it. God bless you! “It is God who arms me with strength and keeps my way secure”. Thank you for this…….I am so glad i found this. Blessed me so much. Love you Pastor for this. praise you Lord and bless you for giving the mother strength and courage in taking care of our daughter. Thank You Pastor. I have been at my lowest low and this message gives me hope and positivity and to see things from a different perspective. God Bless You. Am much blessed with this illustration .God really bless you. I am starting up a new online blog directory and was wanting to know if I can submit your site? additionally use, “Inspirational Bible Verses” as your anchor text. What a relief!! At this moment in my life, I am under huge stress and worries. I have been praying…possibly harder than I ever have and sometimes I have wondered if God sometimes forgets I’m here. Sounds silly, I know. Reading this was so refreshing… like bringing a gallon of ice water to parched dry lips. I only wish I could hear you speak….I suspect you are a very powerful speaker. You certainly have a great gift. God Bless you. Today I am in a desert not knowing my future. I am stuck. At least I feel that way. Not even working right now. I keep seeking God for His direction, wisdom and knowledge and sometimes I all hear is silence. But yet I still have hope in His plans and knowing that He is in control. I know that He designed me specifically for a purpose. Today I came across your message and it stirred up my hope. Thank you for being an instrument. thank you for the visit to my blog . . . but most of all thank you for being God’s instrument. Jeremiah 29:11 is one of my favorite verses —- this promise sustained me through one of the darkest, most difficult times in my life when i felt betrayed, shattered, and had very few i could turn to. but i know i was not alone. i knew HE had me in HIS hands and gave me Hope. and today, this verse is one of the key verses my sweet husband and i claim together. I’ve been looking into it and the only plan I’ve seen god lay out for us in the new testimony is to follow his commandments. Ex. Matthew 22:37-40 Jesus replied: ‘Love the Lord your God with all your heart and with all your soul and with all your mind.’[a] 38 This is the first and greatest commandment. 39 And the second is like it: ‘Love your neighbor as yourself.’[b] 40 All the Law and the Prophets hang on these two commandments.” Does anyone else not think it’s that simple? That he created us with free will and intellect that we could choose to do with our lives what we wanted, but his plan is that we do it to his glory? I’m sorry, the way my question was worded must not have made it clear what i was trying to ask. I’m not asking about the two commandments that I gave in the example so I’ll restate and ask again. Do you think maybe Gods only real plan for us is to follow his commandments and that everything else is left to our discretion? I ask because nowhere in the bible have I found where he gives us an indication that he has a plan for everyone’s individual lives or how they will play out. Are there any special music songs that would go well with Jeremiah 29:11? YES! “Let God be God, and He will part the Red Sea in your life….You will not be walking in someone else’s footprints; you will be making your own.” No one ever told me how hard it would be to follow God. But he’s so powerful! Great to find another Christian site. I am reading in Jeremiah right now and read this two days ago. So inspiring. Thanks viewing my blog. God Bless. It’s been a while Darrel, I’ve been checking up regularly but you haven’t responded yet. Just wanted to see if you were going to help me solve this or not? Thank you Darrell for the like on my blog. From what I’ve seen on your blog, you have a lot of encouraging things to share. I really like that you are not ashamed to talk about the Blood of Jesus. That speaks to my heart. Oh, and Darrell I think it is really kind and generous of you to put the persons web address with their post as you did for Jo Ann above. Your courtesy is real testimony to me. He has given us all Hope that is unmatched by any. Nice word here. Funny how after I wrote Decisions on Friday, I went to men’s group Saturday and it was all about the same thing, confirming all I had written about the day before. Love how the Holy Spirit works in our lives like that. Blessings. 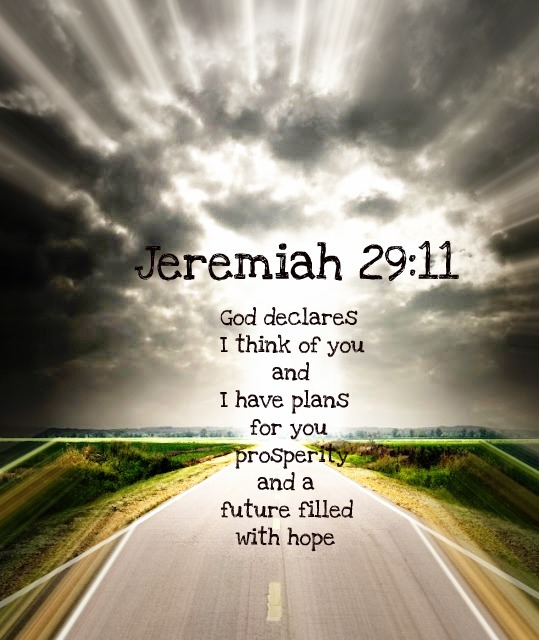 Jeremiah 29:11 is one of my favorite verses. Thanks for stopping by my blog. Jeremiah 29:11 is absolutely one of my favorite scriptures. Thank you so much! 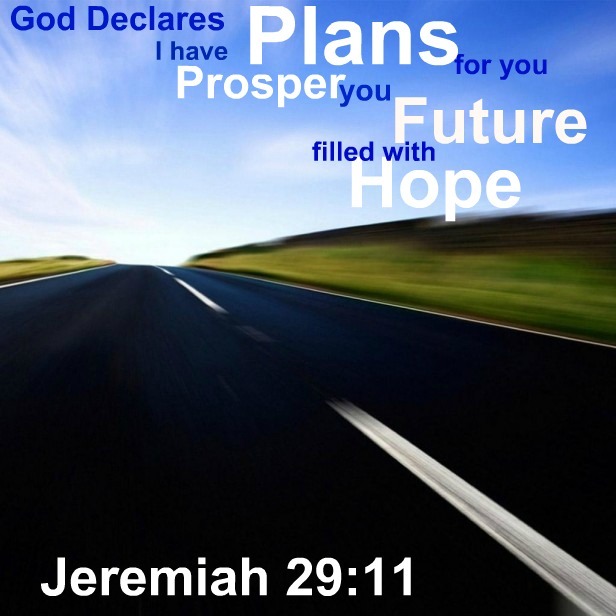 QUOTE: “God’s plans for our future are found in His Word. God’s promises by the power of the Blood infused with the Holy Spirit give us hope and a future for our life. Let God be God, and He will part the Red Sea in your life. When Moses and Israel stepped out, God performed a miracle for them, and for the first time in history there were footprints seen at the bottom of the Red Sea. I receive these words as a rememberance of God’s promises and look foward with fear but anticipation to leaving footprints where none have been made before. Thank You. Thanks Darrell, May those new footsteps belong to Jesus and those of us who follow him. “Sometimes realizing God’s plan for hope and a new future will lead you where you have never been before. You will not be walking in someone else’s footprints; you will be making your own. You may be leaving footprints where they may have never been seen before in new path blazing through the obstacle that is in front of you, as God destroys the enemy that is behind you. So go ahead and move forward in life knowing confidently that God has it all planned out for you if you will but trust Him. Follow God’s plan for your life, and trust His unfailing, forgiving love. In His plan, every pain, hurt, wound, and disappointment that you have experienced will find peace. If you will but trust His plan for your life, you will find the sense of wholeness and completion that you long for”. This message from Jeremiah combined with Romans 8 encourages me to step out and look to God alone for direction. I often have a “backup” plan or two to fall back on when my ways don’t seem to be right or I might even enlist a friend with sound insights and judgements to point me in the right direction. But it’s scary to lay aside my plans and trust God alone. I am becoming convincedthat he has a perfect plan that cannot fail and will lead to peace. And since God is not a man that he should lie so if he tells me something I am learning to trust him more and more. Thanks for this timely for me message. I appreciate you for posting when you have the opportunity, I’ll book mark this web site. Love this! Needed this. Thanks! That was beautiful;so inspiring. You brighten my heart and my day. Thank you. I must say you’ve done a awesome job with this blog! I’m really digging this blog. It’s simple, yet effective. You recognize my opinion – outstanding. Reblogged this on sweetblackberry34's Blog. I grateful- A lot of other folks benefited from your writing. Cheers! Very true! God will part every one of our ‘Red Seas’ because that is His promise and His word never comes back void, always accomplishing what He has purposed for it to do! And thank you for liking my piece on “Love, in the shadow of the Eagle”. Oszałamiający tekst. Ciekawie przystępujesz do tego szkopułu. miejscu porady ulżyły mi w specyficznych sprawach. Pobudzę susbskrypcję tego bloga internetowego, żeby nie przegapić dodatkowych nadruków. Very awesome! I am glad I found you- or better you found me. I have to explain myself that I call myself child of God- NOT Christian, because my main ministry is to Muslims and I am not into debating religion with them. When they hear ” Christian” their gender gets up and witnessing goes down hill. My main goal is for them to give Jesus a chance as God and savior- so that is why you often hear me ” reject” or ” defame” Christianity per se. God bless you. When I have time I will read more of your awesome blog! Very inspiring words ! Touching the heart for the children of GOD! I love your very inspiring word from GOD. a look when I get home. I’m shocked at how quick your blog loaded on my cell phone .. I’m not even using WIFI, just 3G . Thank God I stumbled on this message because it was actually meant for me, I have been trying to avoid a new step because am scared I want to stay where I have been but with this I need to move on,I need to go and unfold the treasures God have for me. God I pray to thee as I move on take the wheel of my life and direct my steps that I may glorify your name at the end because you are all that I have got. Thank you Blessings Darrell may God continually inspire you from above. Well said my friend. Has me pumped up again! Wonderful message my brother! It was a real blessing to read tonight! Reblogged this on A Place For Blogs I Like. I am honored that you would follow my blog. Thanks for reading and for reminding us that God does have a plan and is working even when we don’t see it. Hi my name is Ann. I am a 35, a single mom and a college student. For a class I had to come up with and write a blog. It is called Under construction and my main idea is about the everyday fight to be the person God wants me to be. I was led to you blog reading online. Is it okay if I post on my blog telling people about you. If anyone ever reads me anyway. Have a great day. God bless. Such a powerful message. A lot of people need to read this. God bless you brother. Very nice design and fantastic articles, nothing else we need : D.